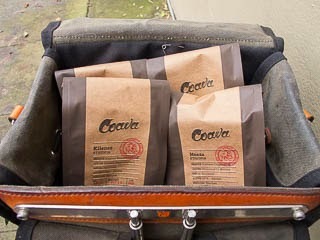 On our last day in Portland it seemed perfectly reasonable (maybe even required) to coffeeneur to one of my favorite coffee destinations: Coava Coffee Roasters. A number of friends old & new agreed to join me there at 10:30. What a wonderful way to start a lazy Sunday. Kasia and I checked out of our favorite B&B about 9:30 and drove to the Lan Su Chinese Garden. Kasia has wanted to visit these gardens for a long time, and this seemed like a perfect opportunity. While she toured the gardens, I could go coffeeneuring! 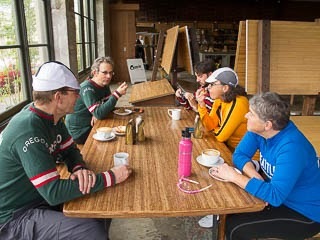 The six of us met at 10:30am and proceeded to take over one of Coava's larger tables. The weather was rather grey and dreary (typical for this time of year) with the promise of rain later in the day. 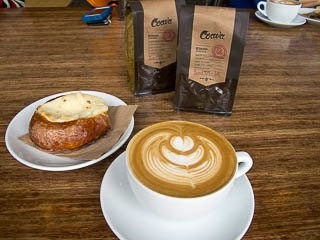 Inside, fantastic coffee and conversation flowed freely. 4.4 miles, and definitely a calorie-positive ride.